Since work on the NBK began in 2016 we have had many conversations with stakeholders, including current and potential contributing libraries, data suppliers, and those with an interest using the services we are building. These conversations have addressed a wide range of issues, including complex questions around data ownership. We have also been spending time learning more about the available technology. This input has helped us clarify our thinking and has resulted in the multi-database model of the NBK presented at the end of last year. This approach offers much great flexibility in how we manage the data and the way we can develop and support the increasing range of services and facilities that the NBK will underpin. 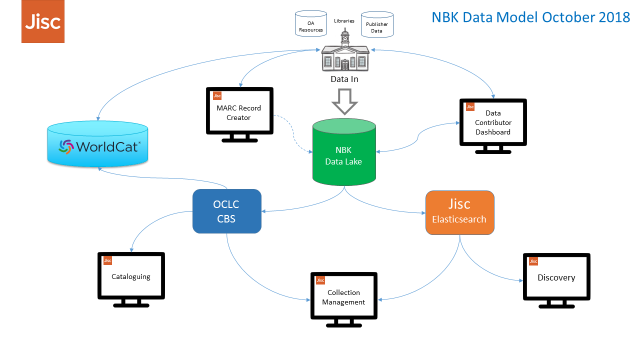 All incoming data flows into the NBK database (the data lake), with MARC data being stored as supplied. From here all relevant data is passed to the other databases. There are significant benefits in this multi-database approach to managing the data relating to the varied use cases for the different services being created, the varying data sources for different services, data licensing considerations, technical considerations, and increasing integration between Jisc services. The data lake allows us to manage the data flow and the records are held as supplied by each contributor before any of the data standardisation activity undertaken for the Library Hub Cataloguing service. This will support flexible development as the data management evolves. For example, as/when we change the record processing for the Library Hub Cataloguing service we will be able to extract and reprocess sub-sets of data without having to re-request data loads from contributors. There has been a lot of community interest in the potential for tools to support libraries in upgrading data where appropriate. We will be exploring developments in this area using the unprocessed data from the NBK data lake, working with the Elastic Search technology we’re using for the Library Hub Discover service. Any work we can do to support libraries in enhancing record quality will then feed into both the Cataloguing and Discover services, as well as benefiting the library’s local catalogue users. Whilst the NBK data lake will initially feed into two databases, it is possible that there will be other variants in future. For example, we will be working with libraries and other Jisc services to explore problems in the area of eResource management, where subsets of NBK records may be combined with data from other sources to offer support in this complex area. By having a dedicated cataloguing database we can focus on data quality. We have heard strong views on a number of issues, for example the merger of RDA and AACR2 source records during the deduplication process. So as the Cataloguing service develops we will be consulting on all aspects, in particular issues relating to data quality, data deduplication and merged record creation. Having a cataloguing database also gives us flexibility in data management. So we will be including records from sources that are of specific value for cataloguing, for example Library of Congress data, whilst excluding data from contributors that do not use MARC, to help maintain the overall quality of the database. In addition, data licensing restrictions mean that not all records can be made available for shared cataloguing. By completely excluding such records from the cataloguing database this simplifies the data management and provides an assurance to contributors and data suppliers that their records are not being shared inappropriately. The Library Hub Discover service will build on the work of Copac, where the focus is on coverage. An end-user must trust that they are seeing the full picture of a library’s holdings, so we will continue to include all records from a contributing library, regardless of quality. We will also be including records from all data suppliers as we will not be making any of the data available in MARC format. For Discover we also need to maximise deduplication, whilst having the flexibility to show the original contributed records. The emphasis in the deduplication and record creation is on creating the best, most complete, record for resource discovery purposes. And as we do for Copac, we will continue to buy in data, such as table-of-content and book cover images, to enhance the value of the records to the end-user. Coverage and deduplication are also the essential elements for supporting the Library Hub Compare service (CCM tools). This will also benefit from the flexibility and analytics capabilities of the Elastic Search open source technology being used for the Discover & Compare database and we will be exploring the way we can use this to best effect with the Collection Management community to create a more flexible and interactive service. The NBK service development work is taking place within the context of wider Jisc development activity that is focused on bringing related services together to provide more effective service presentation and improved user workflows. The Library Hub Discover interface is being developed within this context and it will be facilitated by working with Elastic Search, providing flexible search development. It also provides consistency of underlying technology with other Jisc services increasing the potential for effective service integration, where appropriate. The new NBK system model has emerged from working with community members, data suppliers and others. This approach offers us the best way to allow each service to have a clear focus, and enable services to evolve over time in the ways that best support the core users of that service, as well as supporting ongoing experimentation and new service development. This does create additional work in the short term, but we feel this is an important investment in the long term sustainability of the services being built on the NBK, both now and in future. Posted by Shirley Cousins on 16 April 2019 in NBK and tagged NBK. Whether you want a quick and simple search, or something more complex and specific, the newly launched Discover pilot service, part of the new Library Hub service, will meet your needs. The Discover pilot allows you to easily and quickly cross-search the catalogues of (currently) 49 UK HE, specialist, and national libraries, with another 62 waiting to load, and many more on the way to contributing. Although the search box looks simple, it’s hiding some useful advanced functionality which is built-in to the database and can be accessed by using specific commands in the search box. This last allows you to limit your search by library, and requires use of our library codes. You can also use Boolean operators & | and – (AND, OR, and NOT). The NOT search is something that users have mentioned as desirable in Copac feedback, and we’re pleased to be able to include it in Library Hub Discover. We will also be building these detailed search options into the interface as an advanced search form, along with facets for result refinement. Interface development is ongoing and we would appreciate comments as the work continues, using the Feedback option on each screen. These search options will also be available in the Library Hub Compare interface, which will allow libraries to undertake collection analysis and benchmarking through searching or batch upload of standard or local numbers. Visualisations of search results will be available to enable easy interpretation of collection comparisons, plus export facilities to support further analysis. This Compare functionality will be useful to libraries wishing to manage their acquisitions, deaccessioning, and physical space, individually, regionally, consortially, and nationally. During the pilot stage Compare will be evolving to replicate the functionality of the existing CCM Tools service. The full Compare service will be launching at the end of July and additional functionality will be developed based on feedback from users. Join us at UKSG where we will demo the new Discover and Compare interfaces at the Jisc stand (nos. 52/ 53) on Monday 8th and Tuesday 9th April at 5pm. More details are available on our Events page. Posted by Bethan Ruddock on 1 April 2019 in Events, Interface, NBK. “In recognition of the investment undertaken by Jisc to support academic libraries via the National Knowledge Base (NBK) programme, BDS has agreed to support this initiative by allowing data created at BDS, and already held in member libraries’ catalogues to be made available to the NBK user community for resource discovery purposes in a non-MARC format. We are in discussion with other suppliers and Dawson Books and Askews & Holts Library Services have also indicated that they are content to take the same position as BDS on the supply of their data into the Jisc Library Hub Discover platform. Our intention is to try and get clear confirmation from all relevant data suppliers to UK libraries and then to present the agreements reached and the methods of identifying provenance as clearly and concisely as possible. Whilst these initial agreements represent good progress, Jisc and data suppliers are still looking to maximise prospects for introducing efficiencies into the library data marketplace and are continuing discussions to see if there is a more transformative model that can be agreed that is protective of commercial interests whilst at the same time enhances data provision for the NBK library community. Posted by Neil Grindley on 13 February 2019 in NBK and tagged NBK. We are very pleased to announce that the launch today of the first two Library Hub pilot services, Discover and Cataloguing. 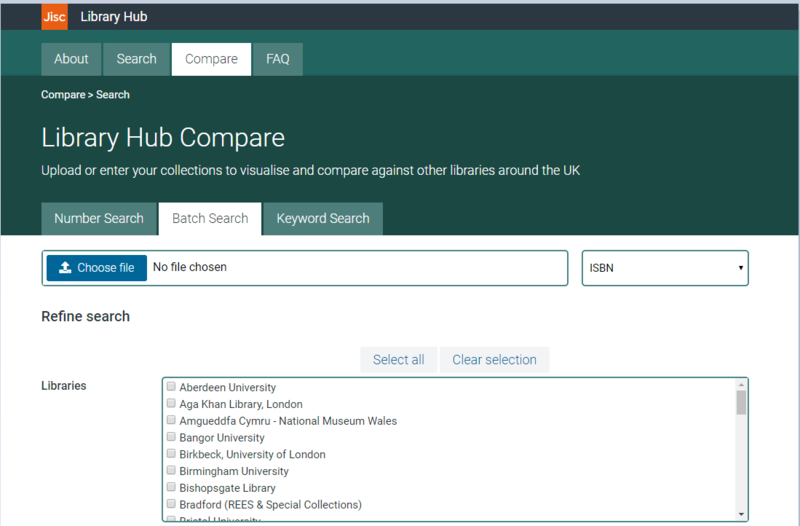 The Library Hub Discover service is a resource discovery interface, giving users free access to search and discover holdings of a subset of the library catalogues contributed to the National Bibliographic Knowledgebase. This pilot uses the initial elements of our new interface designs. The Library Hub Cataloguing service allows eligible libraries to search and download MARC records for use in their local catalogue. This service is available through a web interface and Z39.50 connection, both of which will require authentication. Access is available to current Library Hub contributors. To request access, please complete this form. Both of these services currently contain limited data and functionality, and we will be making regular changes and updates during the pilot phase, up to the full service launch on 31st July. For more information on what is available in these pilot services, please see our About and FAQ pages. We know that the community has been eagerly awaiting the outputs of the NBK project, and are keen to share these early services with you. Feedback gathered during the pilot phase will lead into the full service development. We are grateful for the work of our service delivery partner OCLC, and all of the support from the library community, and look forward to sharing more exciting service developments with you over the next few months. Posted by Bethan Ruddock on 4 February 2019 in NBK. This coming Monday (February 4th 2019) we are intending to make two new NBK pilot interfaces available. Discover will give users free access to search and discover holdings of library catalogues that have been contributed to the NBK; this will initially have limited data coverage and will offer an early view of the new interface. Cataloguing will allow eligible (logged in) users to search for and download MARC catalogue records. These two functions will be soft-launched as the first Jisc products to emerge as part of a remodeled offer that we will be referring to as ‘Library Hub‘ – which will, in due course, provide a portal to the various Jisc services that support the library community in the UK (see the previous blog post by Siobhán Burke for more details). More information about how to access the new services will be announced at launch early next week. In terms of overall progress, the availability of the Jisc Library Hub Discover and Cataloguing interfaces will effectively signal the start of the countdown to the retirement of Copac and SUNCAT at the end of July this year. For those in the community that have grown accustomed to those services reliably being available whenever libraries and their users need them, there may be some trepidation about talk of ‘retirement’, particularly in an era when it has become commonplace to hear about ambitious IT projects foundering under the pressure of real world implementation. We hope, therefore, it is reassuring to see these pilot services being launched (and then further developed) well in advance of them taking over from their venerable predecessors. In terms of what users can expect at this stage from the data that is currently in the system: Discover will be going live with a limited number of library catalogues, with the remainder to follow shortly; we will be gathering feedback as we continue to release further functionality and load more contributors’ catalogues. Cataloguing will contain data that can be used for shared cataloguing and will include the majority of the catalogues we have received, the rest will be loaded as soon as possible. At launch, Cataloguing allows for download of a subset of MARC fields; thus, you may find that you are not downloading the full version of the record. We have endeavoured to ensure that all of the core bibliographic fields have been included, to provide you with useful and useable MARC records. We’re excited to say that we have now received data from over 100 institutions across the spectrum of academic, specialist, and research libraries and this places us comfortably into territory that is comparable with the numbers contributing to Copac/SUNCAT. This is hugely significant. Those services built up that number of contributors over two decades and it is clear that the NBK has managed to replicate that position in just two years because it is understood by large parts of the community to be the logical next-generation successor to both of those trusted pieces of national data infrastructure. Once the Discover and Cataloguing interfaces are launched, the Library Hub team will also be turning their attention to the development of the Library Hub Compare tool which will supersede the Copac Collections Management Tool and the SUNCAT Serials Comparison service by the time of full service launch in July 2019. Given that the NBK looks like it has the support and momentum to achieve its goal of aggregating library data at greater scale than has been possible before, this may be a good moment to remind ourselves what the NBK programme is aiming to achieve and why it’s going to be worth the effort and worth taking the time to build it in a sustainable and scaleable way. We want to work with all academic libraries in the UK to ensure that their collections are as visible as possible for a range of purposes. Whether the use case is for high-end research, for undergraduate study, to showcase institutional resources, to demonstrate collection strengths, for inter-library loan, to increase use of special collections … whatever the reason, every type of library will benefit from sharing their data with the NBK. If we have your data, as well as making it available through Jisc Library Hub interfaces, we can ensure that it is in a format that makes it easy for web-scale search engines such as Google to harvest it and make it discoverable to users who aren’t starting their searches using library tools. We will also work with our service delivery partner OCLC to make the data available via WorldCat. If the community supports the concept of the Jisc Library Hub becoming a central ‘clearing house’ for the aggregation of library data, there is enormous potential for decreasing duplicate practices across the sector and to improve the quality of data that circulates around the data ecosystem/marketplace. As well as talking to libraries, we have also been in discussion with key suppliers of bibliographic data and there would appear to be appetite on both sides to use the Library Hub initiative to take a fresh look at the most efficient way that libraries can acquire high quality catalogue records whilst ensuring that the creators of those records are fairly and sustainably recompensed for their work. With a central view across the data, not only are the Library Hub team in a good position to negotiate with suppliers on behalf of the community, they can also work with individual or groups of libraries to deliver enhanced data back to them. The quality and comprehensiveness of data is a core requirement of Library Hub services but another critical factor is the currency of data. In future we want to work with the community to ensure that wherever possible we are harvesting their data using an automatic workflow on a weekly basis so that the Library Hub becomes the most trusted resource possible in terms of the accuracy of current holdings data. Ideally, we want to go further than that and also work with libraries to access their circulation data which then provides opportunities to dig into intriguing analytics around the usage of resources. Looking at sector-wide patterns (in conjunction with data from other Jisc services such as JUSP and KB+) and feeding that data back to libraries could help inform acquisition policy and collection development strategies. Linking resource usage to student achievement is a very ambitious goal but would provide valuable business intelligence for institutions. 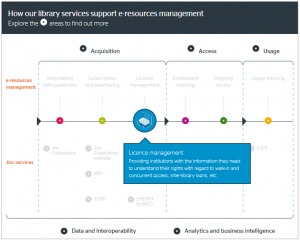 If the community supports Jisc Library Hub to become the trusted and comprehensive source of data for the sector that it aspires to be, it will essentially be building itself a new level of collection management capability that will enable libraries to make important and far reaching decisions about their collections. By having a clear, current and comprehensive view of library holdings (and e-Journal and e-Book collections), they will be able to make confident data-driven decisions about resources, especially where low-use collections appear to be providing excessive redundancy in the context of regional or national availability; or where digital surrogates or versions provide more effective provision than their print equivalents. The Library Hub team at Jisc (working closely with OCLC colleagues) have been incredibly busy over this last phase, maintaining a high standard of current Copac service delivery as well as working towards this exciting milestone in the NBK work programme. The services we are launching on Monday are the next step along the way. We’ve still got a long way to go but if we stay focused on the opportunities and the benefits that we can deliver by all working together, it may be possible by the end of 2020 to deliver the kind of transformation that was imagined by the National Monograph Strategy way back in 2013. Posted by Neil Grindley on 28 January 2019 in NBK and tagged NBK. Jisc has been working on a transformation programme to develop a more effective, efficient and cohesive set of library services to meet the needs of its members and deliver a number of benefits. The programme includes seven separate Jisc services: Copac Collection Management Tools; Copac; Jisc Collections; Knowledge Base+; JUSP; SUNCAT and Zetoc; as well as the RLUK shared cataloguing service. The transformation will redevelop these services in a number of phases, delivering them in a fresh, streamlined and sensible way. Rather than visiting eight separate and distinct services, users will encounter only three sites which will encompass all the existing service functionality. The three new service areas have been formally named under a new collective offer, Library Hub, with individual names reflecting the functions that each area delivers. The new names, indicating the consolidation of current services, are listed below. We will simplify our service portfolio so that it is easy to understand, provides clarity about what our services do and how they support your work. We will implement a modern and consistent design across our services delivered to accessibility standards, providing the same experience for any user, making it easier to move between services. We will extend automation over manual processes within and across our services, enabling users to exploit the data within more efficiently. We will coordinate and consolidate our service communications, including our training provision, which will be made simpler via the clear and consistent offer. The transformation of our infrastructure will ensure that our services can more easily accommodate and support changes in our sector into the future. How will TLSS deliver the benefits? Of these, the user experience re-design of the service interfaces is the one that will have the most immediate impact to using the services. Over the last year, we have been working with user experience consultants to plan and progress a way forward that will deliver the coherent vision mentioned above. As part of that process, we have had input from service users, as well as extensive research into the services and workshops with service teams. The Discover and Compare functional area incorporates four of our Discovery services, plus the RLUK shared cataloguing service, which will essentially bring together the outputs of the NBK project with the alerts function from the Zetoc service. Buy and Manage, or Collections plus as the interface will be named, will merge the KB+ service functionality with the upcoming Jisc Collections e-commerce site. Analyse usage data, or Analytics, although currently only includes JUSP, the expectation is that over time, other usage or data related services could be incorporated with a wider scope than e-resources data, for example. The new designs and interfaces will be delivered in phases through 2019 and 2020. The first phase will see the release of the Discover interface and more detail on that will be coming in February 2019. Why are we doing TLSS? The origins of this programme stem from an extensive review of our library support services in 2015, which had input from 80 UK academic library staff as well as UK stakeholder groups SCONUL and RLUK. The review was instigated as it was recognised by Jisc that its offer was found to be fragmented, complicated and service-driven, rather than being driven by the needs of service users. Also, we were keen to ensure that our services remained valuable for our members in an environment where libraries face both fundamental challenges and opportunities. The review outlined a number of recommendations, which have formed the basis of this programme. 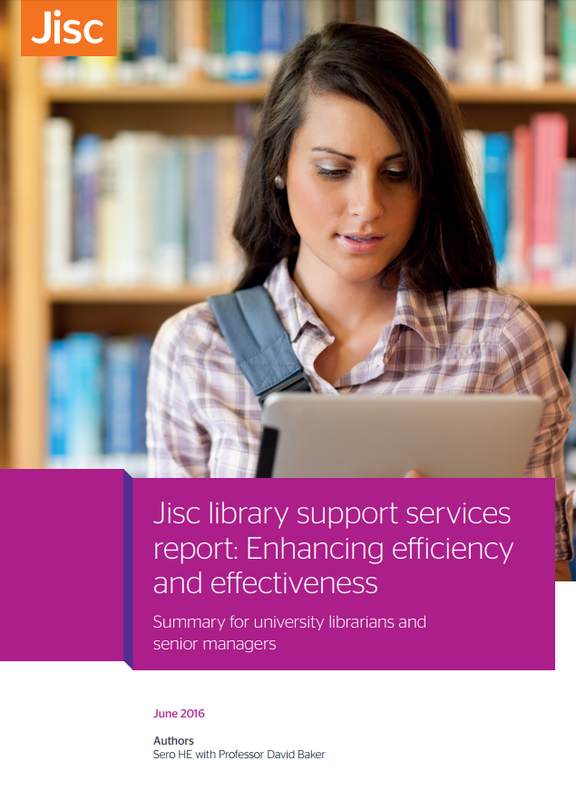 A summary of the review, Jisc library support services: enhancing efficiency and effectiveness, is available on the Jisc website: https://www.jisc.ac.uk/reports/library-support-services-enhancing-efficiency-and-effectiveness. Posted by Siobhán Burke on 24 January 2019 in Interface, TLSS. We have been busy working on the National Bibliographic Knowledgebase (NBK) project over the last few months, and would like to update you on some key areas of progress. As part of an evolving strategy to optimise prospects for delivering the best possible functionality that the NBK can provide we have formally opted to design a live service delivery model that is reliant on a dual platform approach. The above figure represents how we see data flowing into the various components and interfaces of the NBK system. The crucial innovation with this data model over the original conception for the system is the inclusion of an Elasticsearch indexing engine which will provide speed and flexibility for the discovery layer. The division of data into a cataloguing instance and a discovery instance also greatly simplifies issues around data licensing, rights & reuse. All data that is sent to the OCLC CBS system for inclusion into the copy cataloguing system will be of reasonable or good quality and will be rights cleared for the NBK community to download and reuse in MARC format. All data that is submitted for inclusion into the NBK will be included in the Discovery instance of the system and will represent a comprehensive view onto the holdings of NBK libraries. We are working towards launching some key components of a live NBK service in early February to replace the currently available beta interface but we are intending this to be a ‘soft launch’, as none of the NBK services will by that point be available in full. We are working with a design and UX agency to design the new resource discovery interface, and we hope to be able to show you these designs, along with the new service names, in the first week of February. The full launch of the NBK services will be at the end of July 2019. The NBK Community Data Groups ran a survey over the summer and the response rate was excellent (99 institutions completed the survey). The responses have provided us with a fascinating set of data which has already proved invaluable in informing our work. A headline summary of the results is now available on the CCM Blog. The slides feature visualisations of a selection of 21 questions that the extensive survey posed to the community. We now have 170 institutions who have agreed to participate in the NBK. Of those, 96 have sent data for inclusion in the database. You can see the most current list of contributing libraries here. Posted by Bethan Ruddock on 6 December 2018 in NBK. Who owns your library catalogue data? And what are you allowed to do with it? During the last few decades, many libraries have adopted a strategy where they have decreased their reliance on in-house cataloguing effort and have preferred to purchase the majority of their bibliographic records from a range of service providers. While sometimes this data might be purchased outright, more often it is licensed and reuse restricted. Many libraries will alter or amend the data they receive to meet localised needs or to align with institutional practice, thereby subtly or sometimes significantly changing the original record. Libraries may obtain records from multiple suppliers and those suppliers often obtain an original base record from another source and then add data to the record in the same way that libraries do. So, from a library perspective, there is strong sense that assertions of ownership may not be well-founded once records begin to pass along a chain – or multiple chains – of stewardship. And that is presuming that you know what the licensing conditions are for a particular record. Libraries who have not traditionally shared their data with union catalogues or aggregators, or for who doing so was not an option, may not have preserved the provenance data. The terms of licenses signed many years ago may have been lost. And although some libraries who create their own catalogue records are assigning licenses (such as CC0) to them, many do not. Add to this the difficulty that data may be eligible for reuse in some formats (eg HTML) but not others (MARC), that some records may be reused singly but not in bulk, and that different bodies may have different reuse rights, and the library data ecosystem becomes extremely complicated. It’s a complexity that we have to deal with, if the NBK is to be successful in its goal of improving prospects for the sharing and reuse of bibliographic data across the library data marketplace. To help us with this, we’re very pleased to have Ken Chad doing a consultancy project exploring the library bibliographic data ecosystem. Ken’s project is running until October, and should provide us with some direction through these thorny issues. We’re also convening a Library Data Rights working group of representatives from the library community, to guide and inform this work. If you have any comment you’d like to make on this issue, as a library or data supplier, please contact nbk.copac@jisc.ac.uk and we’ll put you in touch with Ken. Posted by Bethan Ruddock on 9 August 2018 in NBK and tagged metadata, NBK. Digital technology is revolutionising research. At the same time, research processes and practice are modernising and these developments mean a new role for the library in supporting both the research institution and strategic requirements of the university. Research is a global endeavour and supporting modern research requires changes at institutional, national and international levels. The library has always been a key pillar in supporting the pursuit and acquisition of knowledge and – along with other actors – need to both adapt and lead change to achieve the aspirations of modern innovative research. Digital will power new forms of research and open up new opportunities. Data will be a key driver in this, leading to increases in the speed of access to outputs, greater collaboration and sharing across disciplines. It will lead to more openness and transparency in the research process, generating more value and new discoveries, as well greater impact and trust. Developments such as these will enable greater partnerships and collaborations, amongst researchers globally and with industry and society at large, helping meet the goals of knowledge exchange and those of policy makers, as well as delivering wider impact and benefits to society. There are many challenges we face to ensure we can reap the full benefits, not least the skills required by researchers and those who support them in this technology driven landscape. How can institutions adapt to ensure they have the right skills, support and staff embedded across the research life-cycle? All of this will radically change the nature of research and how the future library can not just support these developments, but is a driver to deliver them and the benefits they can bring. The 12th biannual Jisc and CNI conference will bring together leading experts in digital scholarship from the US and UK to explore, and share leading international practice and policy, addressing these themes. As well as representatives from a further 20 international research organisations including Mellon Foundation, University of California, Berkeley, University of Manchester, University of Edinburgh and Wellcome Trust. Posted by Siobhán Burke on 2 May 2018 in Events. We have also developed some quick guides covering key areas of the e-resources management lifecycle, in a little more detail. These areas are purchase and licence management; supporting discovery and delivery; tracking ongoing access; and finally collection evaluation and review. These are available from our Guides page. Posted by Siobhán Burke on 1 May 2018 in Communications.